Scent Description and Notes: “Taylor, herself, is the muse for Wonderstruck Enchanted—forever captivating and always confident. 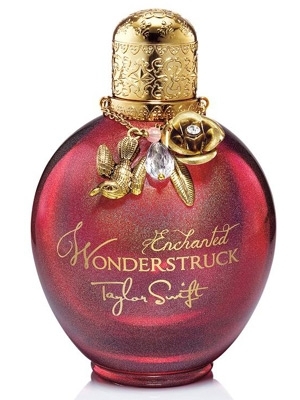 Wonderstruck Enchanted continues the magical journey, from the first spark to that moment when you know you’re enchanted. Bottle Design and Artwork: This is a standard 1.5ml sample vial. The vial is a clear glass, a plastic nozzle, and red writing (font varies from fancy “enchanted” type lettering to basic block font design) featuring the brand and scent name along with the amount, and production information. ITV: It’s very fruity, like verging on teen fruity, but it does have a slight cranberry tone that brings it back from that side, even when nestled amongst the rich, creamy vanilla and musk notes. Wet: Once I get past the alcohol, the scent is already drying. However, I can still pick up the berries, passionfruit, vanilla, and musk…along with peony now. Interesting. It is pretty feminine and sweet, so if that’s your style, I’m recommend it. Dry: Now that it has dried a bit more, the passionfruit and berries are still the most dominant notes, although the vanilla and musk are close behind. The peony is still there, but I’m not getting freesia or champaca, both of which are fairly distinctive. It’s nice, but it’s not a top-10 scent. Other Impressions: For me, this is a scent I’d want to wear if I were wearing a chiffon dress prancing through a rose garden. It’s too sweet for me to be a regular scent as I refer heavy resins, but it is something I would consider wearing given the mood and the occasion. From my husband’s perspective, he likes it. He claims it is close to what he would wear, but the soapiness and the woods keep it feminine.